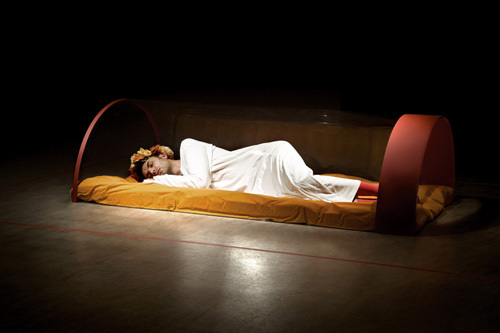 Radziszewski's re-performance of Dreaming (1979) by Natalia LL, an artist who also appeared in his America Is Not Ready For This project (2011–2014) is oscillating between the archivistic and corporeal drive. First performed in 1978 and repeated on different occasions and in various places (in a capsule, under a sort of pyramid that was supposed to act as a biochemical and bioelectrical catalyst), Dreaming explores the dream dimensions along with mundane daily activities, which Natalia LL has always depicted in her work, like eating or copulating. It aims at highlighting the two levels of dreaming: internal, perceptible only by the one asleep; and external, or rather the perception of a sleeping body by spectators. As she wrote: "Dreamings were an attempt to visualize the most intimate, usually unconscious experiences, and proved they cannot be translated. Intimacy meant here not inner isolation but being sensitive for subtle impulses coming both from inside and outside". This is why Natalia LL repeats the action in different contexts and organises its re-enactments in other people’s interpretations – to perceive and register the same action "from the outside". It is an early example of delegated performance (Claire Bishop) that from the very beginning lends itself to the expressive potential of re-performance. Despite starting from the same expressive needs, in his re-enactment Karol Radziszewski applies a strategy known in queer studies as queering the model, a term I allow myself to use this time to indicate the process of substitution and reversal implemented by the artist, which opts for the same dialectic of gaze (George Didi-Huberman) that is activated in the intermittent relationship between the one who looks and the object that is being looked at, modifying the sign. Radziszewski, just like Natalia LL, offers himself in his being human, too human, surrendering himself, despite everything, to the audience who can see him sleep during the whole course of the opening of his exhibition. 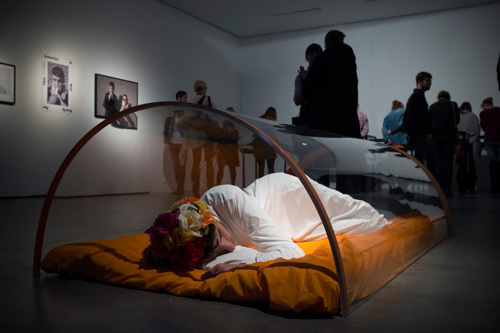 The artist repeats the performance in the version from the PERMAFO Gallery in Wrocław (1979), appearing under a glass capsule, which is an exact copy of the one used by Natalia LL in Wrocław, and wearing the same outfit: Radziszewski lies on an orange blanket, dressed in a clean cut white robe, colourful socks and a wreath of flowers on his head.